Here, at Restroom Stalls and All, we provide high-quality, affordable toilet partitions and bathroom accessories across the country. Our restroom stall dividers come in many materials, colors, and aesthetic style options. There is sure to be something to fit your business's branding style and needs. And, even better, all of our products are available for order online for your convenience. When it comes to running a business, your attention is constantly divided and forced to manage several things at any given moment. Worse, your company bathroom may very well be low on that list. It shouldn't be at the lowest of your priority list, especially when you learn that a clean and well-stocked bathroom has a huge impact on business. Don't skimp on your company bathroom, keep it well stocked at a great price with our toilet partitions and bathroom accessories.We have a wide selection of items available for our customers to order online. 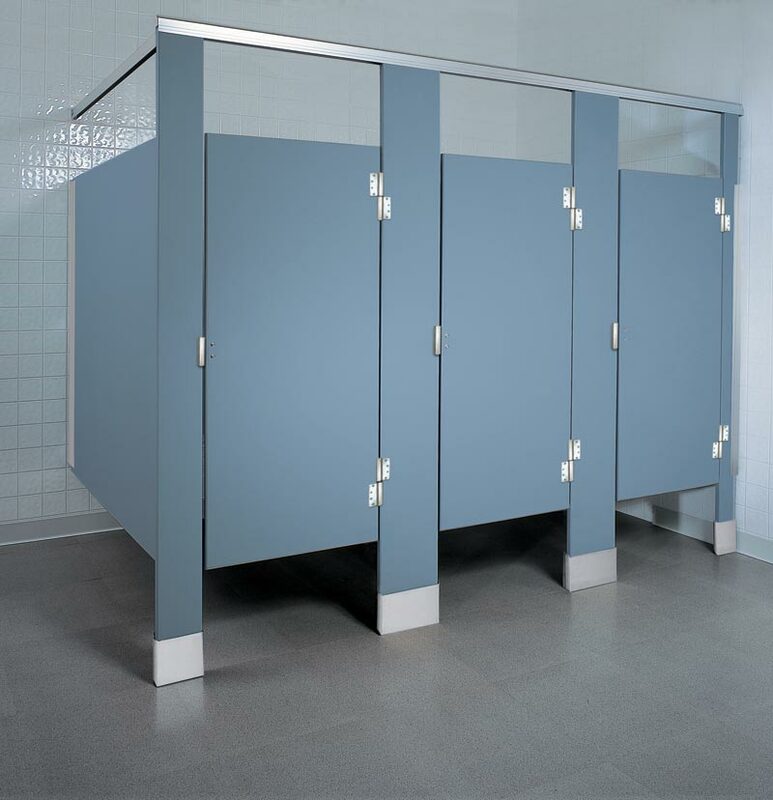 If your business is looking for quality, ADA-compliant commercial toilet partitions, look no further than Restroom Stalls and All! We are proud to service clients throughout Georgia, providing bathroom partitions and installation services. 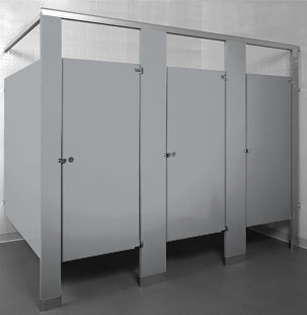 Restroom Stalls And All offers an extensive selection of toilet partition styles. You can trust Restroom Stalls and All to supply your business with toilet partitions that are built to last. We stand by our products — and our service — and that is why companies turn to us for their bathroom supply needs. Contact one of our commercial bathroom consultants today to find out how we can help take care of your business! If your business is looking for quality, toilet partitions to enhance the look for your commercial bathrooms, contact Restroom Stalls and All. We are proud to service clients throughout Northern Georgia, providing bathroom partitions, unmatched restroom construction services, and consultation and installations. Using a particle board as a base, high-pressure laminate is applied to create a protective coating on this type of toilet partition. Manufacturer warranties typically last between one-to-five years. This is one of the more affordable material options, with a cost slightly higher than powder coated steel toilet partitions. On top of their affordable price, these partitions are easy to install, which can save you time and labor. Perhaps the biggest appeal to plastic laminate is the vast array of color options you have to choose from, including wood-grained, Earth tones, solid patterns, marble, and granite. Plastic laminate partitions hold their own in just about every aspect imaginable, however, they do have one primary drawback; they don’t stand up against humid climates. Environments with extreme humidity, such as inside a company shower, can damage the material. This does limit the functionality for certain applications, but with this one caveat, plastic laminate is still a solid choice all around. Made from high-density polyethylene, these partitions are simply sheets of quality, durable plastic. Manufacturer warranties are can be found that cover up to 15 years of product use. While a little more costly than plastic laminate partitions, solid plastic can still be a relatively affordable material option. Unlike plastic laminate, solid plastic partitions can be used in any type of environment, even if it is humid (like in a company shower room). They are also easy to install, which saves money and labor in the long-run. Even minor damage, such as vandalism, can be easily fixed by heating up and smoothing the partition material. The major drawback for solid plastic partitions lies in the upfront cost. But, when factoring in the longer warranties and extra durability, the costs even out or tip in favor of solid plastic over time. Powder coated steel toilet partitions are made from a thick layer of steel that is filled with a panel of honeycomb cardboard. A powder coating is applied by baking the finish to the steel in an oven. Manufacturer warranties typically cover one-to-three years. 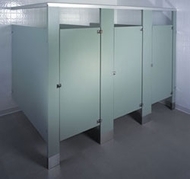 Powder coated steel is probably the most economical toilet partition option. Adding to this benefit, this partition is extremely easy to install. This style of partition is also very lightweight, which makes it one of the easiest partitions to install, and by far the most favorable. Another benefit to this material is that it can easily be painted over for touch-ups or style changes you want to implement in your company bathroom. While they are easy to change colors, the pool of color options to choose from is more limited than with other materials. Additionally, while installation is extremely easy, due to its metal makeup, powder coated steel partitions need regular maintenance to avoid rust buildup. 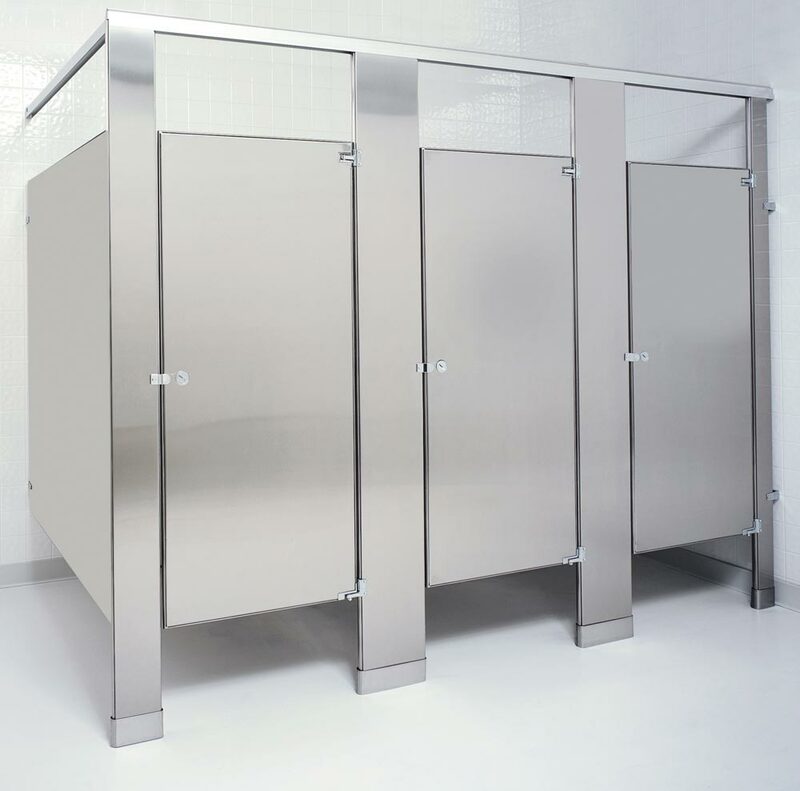 Stainless steel is one of the more high-end toilet partition materials. This does mean a higher upfront cost. Stainless steel partitions typically come with a five year manufacturer’s warranty. Stainless steel is by far the most luxurious partition material on this list. That means that they are a must have for businesses trying to give off a classy feel. Not only do they look luxurious, but they are also designed to work in any environment, which widens their application. Getting things done right the first time usually means putting in a little extra effort. Since the process of installation for stainless steel toilet partitions is more complicated than other partitions, this means there will be a bit more hassle during installation for that appealing, high-end look. Solid phenolic color thru, also referred to as compact laminate, is a versatile and durable bathroom material. Manufacturer warranties vary. Made from a solid core, this plastic panel handles any bathroom environment with extreme durability. A long shelf-life, easy maintenance, and its high resistance to damage are all hallmarks of this toilet partition material. Solid phenolic color thru partitions are completely water-resistant, and come in a wide variety of color options. 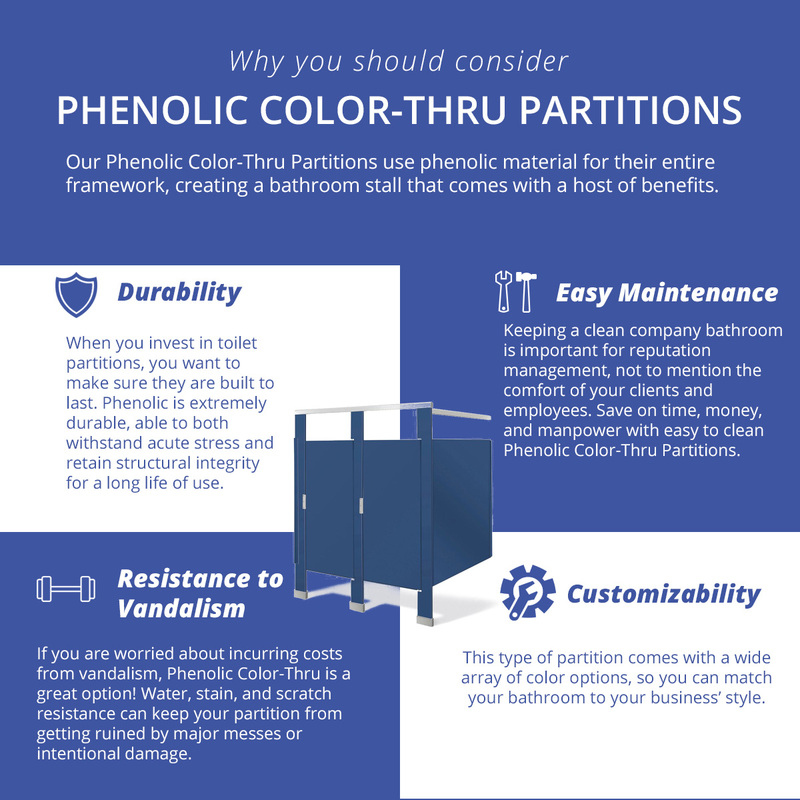 Solid phenolic color thru is a bit pricier than other standard toilet partition materials, which definitely means you will pay a higher upfront cost. However, when you factor in the durability of the material, that cost can even out over time. You can trust Restroom Stalls and All to supply your business with toilet partitions that are built to last. We stand by our products and their ability to meet our customer’s needs. Contact one of our commercial bathroom consultants today to find out how we can help take care of your business! If you are in the market for toilet partitions, you need look no further Restroom Stalls and All — a leading provider of restroom products and services for businesses in Georgia. The state of a commercial bathroom can often be a reflection of how successful and well-managed it is. Have you ever seen a business with a run-down, dirty bathroom that was thriving? We haven’t, either. That would turn away just about any customer pretty fast, right? Though cleaning and maintenance can keep a bathroom looking nice, it isn’t the only way to keep your business’s bathroom looking pristine. Partitions are a great way to elevate the current aesthetic of your bathroom and lift it to new standards. Here, at Restroom Stalls and All, we would like to offer you some tips when choosing what kind of toilet partition material would best benefit your business. Different businesses are going to be willing to spend different amounts upfront for bathroom accessories, depending on their financial situation. When deciding on toilet partitions, you never want to skimp on the materials, but that doesn’t mean there aren’t still different quality options available. Both of our plastic laminate and solid plastic material options are made for the economy minded business without sacrificing an ounce of quality. Different partition materials require different amounts of cleaning and maintenance. Stainless steel offers a resistance to just about every form of grime, dirt, and damage there is out there. However, all of our toilet partition options resist staining and damage to a large extent, which is something to consider when weighing your options. Other forms of damage that you will want to plan around when choosing your partition material include moisture, chemical cleaners, vandalism, etc. The amount of traffic your company restroom will see should also heavily affect your decision. Higher traffic bathrooms may benefit from sturdier materials, like powder coated or stainless steel. However, even a bathroom without a lot of traffic will still need toilet partitions that can handle some small amounts of stress. Your company bathroom is very much a part of your business, and its style should also reflect your business. Is your office bright with pastel colors and lots of light? Solid plastic partitions have lots of style of eye popping color options to choose from. Maybe your business has a more industrial look; if so, stainless steel may be the perfect options. Each material provides a different aesthetic, and many materials can be customized to look how you want. While we are admittedly biased on this one, it is important to do your due diligence to make sure the company you’re buying products from is a legitimate and reputable business. Partitions may not be the biggest investment you’ll make with your business, but they are not to be underestimated either. Though a friendly phone call should be all you need to get any information on the business in question, you will need to find other bits of information as well. For instance, you may want to term to the internet if you are interested in a business’s reviews or testimonials. By assessing the quality of work a company has been able to provide past customers, you will be able together if their services are right for you. Also, while on the internet, you may also want to view the company’s website to get important information, such as any warranties they offer, special deals, and so on. Have you ever suffered from decision fatigue? It’s something that business owners and compulsive shoppers both suffer from when overwhelmed by too many choices. At a certain point, our brains just don’t have the processing power to analyze our choices. If you are a new business owner, it’s entirely likely that by the time you get to picking out your restroom stall materials, you are suffering from decision fatigue. To help you on your search, we thought we would answer some commonly asked questions about bathroom partitions. Can I order my restroom stalls online? Here, at Restroom Stalls and All, we deliver our toilet partitions across the nation when customers order our products online. However, we can only perform installation services within our service area. There is a huge selection to choose from, so make sure that you understand all of your options. What are my material options? We have six types of high-quality, affordable bathroom divider materials available from our online store. Our bathroom materials range as follows: Phenolic Color-Thru, Phenolic Black Core, Plastic Laminate, Powder Coated Steel, Solid Plastic, and Stainless Steel. Each of these partition materials comes with its own set of benefits and drawbacks. Check out an overview of each material under our “Toilet Partitions” page in the main navigation of our website. Can I install my bathroom partitions myself? Yes, you can, although some carpentry and technical skills may be required. However, if you are within our service area, one of our professional technicians can perform the installation for you, ensuring that it is done correctly and in a timely fashion. Please feel free to give us a call if you have any questions about the installation process. How do I choose the best toilet partition for my needs? The best way to decide on your toilet stall material is to read our overview of each in the main navigation. The style, color, texture, durability, and resistance to vandalism will all be factors in your decision. All of our material options are high-quality, durable, and made to last for decades. Again, please feel free to give us a call for more information about a specific material. Can I buy in wholesale? We do not offer any wholesale options, however, our prices are very competitive, and our products both affordable and high quality. We also carry an impressive selection of materials and accessories to fully stock your company bathroom. Chances are, unless you are a major corporation, that your bathroom doesn’t need equipment to justify wholesale purchases. We always recommend price shopping materials before a decision; chances are, we will have it at a better price. What is your installation service area? We service almost all of Georgia, including Atlanta, Decatur, Oakwood, Athens, Buford, Cleveland, and many more cities. Additionally, we can perform restroom partition installation in many parts of Tennessee, Florida, South Carolina, and Alabama. Please feel free to give us a call if you want to make sure your business is included in our service area. In addition to our toilet partitions, we have a huge inventory for you to look through that will fully stock any company restroom. From toilet paper dispensers to hand towel dispensers, we have everything you will need to completely stock your bathroom. The perfect company bathroom is just a click away! Please feel free to give us a call with any questions about our products, delivery, or installation. We will be happy to provide any answers that you may need. Your company bathroom says a lot more about your business than you may think it does. Even if it's not something you personally think about, your employees and customers surely do. A bathroom remodel can be a great way to improve the look and functionality of a business, giving it a better public perception. But a bathroom remodel is a big step, so you'll want to make sure you know what you're doing before you start. 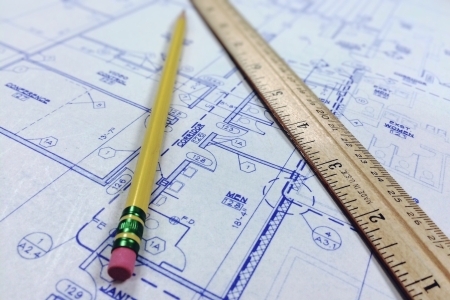 To that end, here are some tips for a successful company bathroom remodel. Renovations are costly enough without having to consider putting aspects of your business on hold while they take place. For that reason, it's important to get them done as quickly as possible. The best way to do this is effective planning, starting with an outline of the timeline. Ideally, your contractor will be able to work with you to ensure the minimal loss of productive business time. Often, the work can be done during normal business hours upon request. How do these features reflect my business' image? Do these bathrooms see heavy or light use? Are my bathrooms likely to be vandalized, requiring more durable materials? Is this a long term renovation or a short term "patch up"? Who will use your bathroom? Adults? Children? Teens? For the most part, it is easy to tell a bathroom that was built over a decade ago just by walking into it; gilded plumbing fixtures or dated, cracked tiles are two main giveaways. Believe it or not, there have been many advancements in bathroom technology, even in just the past couple of years. Nowadays, there are motion-sensor faucets, automatic towel dispensers, and touch-free hand dryers. However, there are many rules when it comes to commercial bathroom renovations, so make sure your contractor knows about your current fixtures in order to comply with any renovation requirements. For a business, you will want a commercial contractor. Make sure to do your research to find the best candidates in your area, then it is time to do some vetting. Ask for quotes, credentials, check BBB and other business rating platforms, and generally do some snooping into the quality of their work. Make sure they understand your needs, and that you feel comfortable that they will be taken care of. 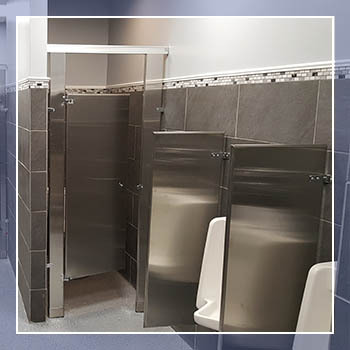 Here at Restroom Stalls and All, we sell high quality restroom partitions, equipment, and accessories all across the nation. If you are looking for high functioning, affordable bathroom equipment, we make it easier to buy than anyone else. Just go online, find the right toilet partitions and bathroom accessories for your needs, and place your order. Your order will be delivered right to your place of business. We also perform toilet partition installation in certain areas. Please feel free to give us a call for more information about our products, shipping, or installation services. One of our friendly and knowledgeable representatives will be happy to provide any answers you may need. Here, at Restroom Stalls and All, we sell restroom partitions, equipment, and accessories across the nation. If you are looking for high-functioning, affordable bathroom equipment, we make it easier to access these materials. What should you do? Well, all you have to do is go online, find the right toilet partitions and bathroom accessories appropriate for your needs, and place your order online. The items that you have ordered and paid for will then be delivered right to your place of business. Aside from offer restroom accessories online, we also perform toilet partition installation in certain areas. Please feel free to give us a call for more information about our products, shipping, or installation services. One of our friendly and knowledgeable representatives will be happy to provide any answers you may need. This is the type of bathroom partition you will find in the United States. Standard partitions have a foot-long gap at the bottom of the doors, as well as sight lines along the door’s edges that allow people to see through in case of emergency. European bathroom partition differ slightly from standard models, but share many similarities. For instance, these types of toilet partitions have much smaller gaps at the bottom, leaving just enough for wheelchair movement. They also have no sight line gaps. Another common feature of European partitions is that they are often connected to the ceiling (variations can apply). Nowhere near as popular as the standard partition model of America, there are still plenty of single room bathrooms in commercial buildings. Usually found in smaller businesses or doctor's offices where privacy is important, single room bathrooms are what the name implies: an actual single enclosed room. In addition to partition types, there are also a few different common partition configurations. This is essentially just the layout of the partitions, and is based on the structural necessities of the room and partitions. Standard Configuration -- A standard configuration single partition has a 24 inch door that swivels inward. ADA (handicap) Configuration -- A requirement in every company bathroom, ADA partitions have a wider body and door, which is at least 36 inches. Alcove Configuration -- In an alcove bathroom, one of the restroom stalls will be larger than the others, and reach from the wall on one side to the wall on the opposite side of the room. In-Corner Configuration -- This configuration occurs when the stalls are all nestled in a corner (surrounded by three walls), and is usually done for structural hardware reasons. Between Walls Configuration -- This configuration is very similar to the in-corner (and will often overlap). It is just a partition configuration where the partitions are set between two walls. When you invest in toilet partitions, you want to make sure they are built to last. Phenolic is extremely durable, able to both withstand acute stress and retain structural integrity for long use. That makes them a great long term investment, as with proper care and maintenance they can outlast many other materials. Keeping a clean company bathroom is important for reputation management, not to mention the comfort of your clients and employees. Save on time, money, and manpower with easy to clean Phenolic Color-Thru Partitions. Use that energy to improve other aspects of your business instead. If you are worried about incurring costs from vandalism, Phenolic Color-Thru is a great option! Water, stain, and scratch resistance can keep your partition from getting ruined by major messes or intentional damage. Vandalism is an unfortunate reality for many businesses, and hardier equipment is sometimes the best, most cost effective way to combat it. This type of partition comes with a wide array of color options, so you can match your bathroom to your business’s style. Bathroom aesthetics matter more than many business owners realize, so make sure you are sending the right message for your business with yours. Just like every one of our quality partition materials come with a host of benefits, there is usually at least one “drawback” to consider as well. For Phenolic Color-Thru, that is its price point, which is a little higher than other material options. However, when you consider the longer lifespan and added durability, they can end up being more cost effective in the long run. Hopefully, you found this information informative. If you are looking at making a purchase of new bathroom partitions, check out our quality online selection! Restroom Stalls and All carries only the very best in bathroom stall materials, as well as bathroom accessories. We also perform installation in certain areas. For more information on what partition option might be best for your business, please do not hesitate to give us a call. One of our friendly and knowledgeable representatives will be happy to provide any answers that you may need. Here, at Restroom Stalls and All, we carry the highest quality toilet partitions and bathroom accessories online for business around the country. A company’s bathroom is more important than many owners realize, because it is part of how a business is seen. That is why choosing the right bathroom partition material is so important. We carry six types of partition materials. 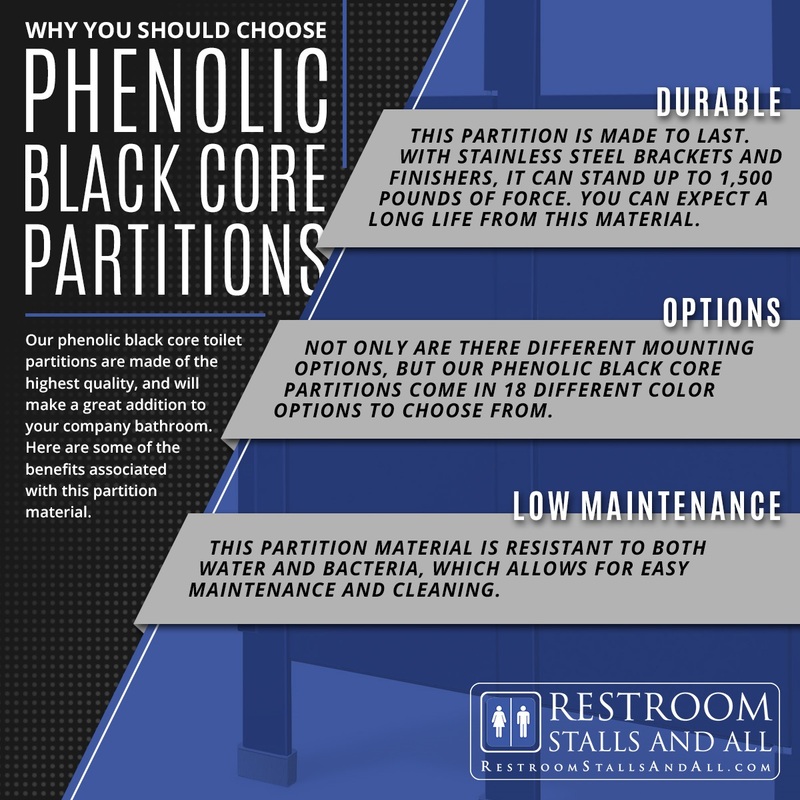 Our phenolic black core toilet partitions are made of the highest quality, and will make a great addition to your company bathroom. Here are some of the benefits associated with this partition material. This partition is made to last. With stainless steel brackets and finishers, it can stand up to 1,500 pounds of force. Corporate bathrooms often see more wear and tear than residential bathrooms, not to mention the potential for vandalism. Luckily, this material stands up to some serious stress. You can expect a long life from this material. Not only are there different mounting options, but our phenolic black core partitions come in 18 different color options to choose from. No matter what kind of aesthetic you are trying to build for your business, there is a great chance that this partition material can match it. The more choices you have, the better chance that you will find the right one for your business. This partition material is resistant to both water and bacteria, which allows for easy maintenance and cleaning. Commercial bathrooms see a lot of use, so any absorbent or hard to clean partition materials can degrade fast. Luckily, you won’t have to worry about that with our phenolic black core material. 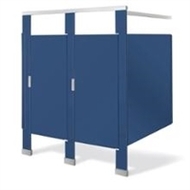 At Restroom Stalls and All, we carry phenolic black core partitions, along with five other high quality partition materials: phenolic color-thru, solid plastic, plastic laminate, powder coated steel, and stainless steel. If you are interested in any of our products, please feel free to check out our online selection. For more information about our products or shipping, please give us a call at your earliest convenience. We look forward to hearing from you! 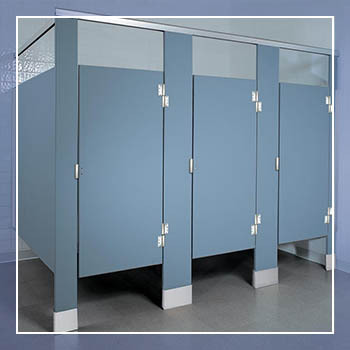 Restroom Stalls and All is proud of the quality of the restroom dividers that we offer. One of our options is a solid plastic toilet partition material. Our solid plastic toilet partitions, sold online, are high-quality, and can bring a host of benefits to your business. And a company’s bathroom is a bigger part of its business than many owners realize. 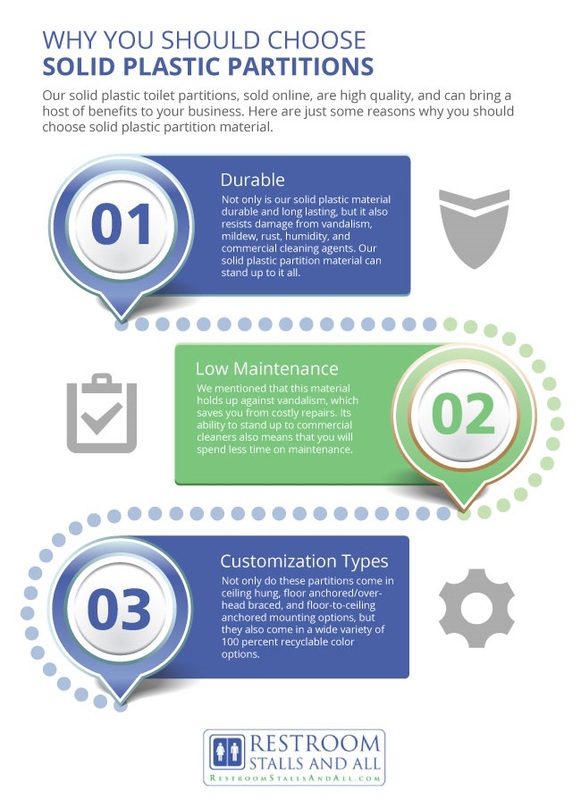 Here are just some reasons why you should choose solid plastic partition material. Not only is our solid plastic material durable and long lasting, but it also resists damage from vandalism. Anybody who has ever owned a retail store can tell you first hand how much time and money you can save by marking vandalism off your list of worries. Mildew, rust, humidity, commercial cleaning agents, our solid plastic partition material can stand up to it all. On top of that, solid plastic has a lower upfront cost than many other partition material types. We mentioned that this material holds up against vandalism, which saves you from costly repairs. But that is not the only aspect of bathroom maintenance that will get easier for you with this material; its ability to stand up to commercial cleaners also makes it require less maintenance. If you hire out your maintenance staff, this can actually save you money. Not only do these partitions come in ceiling hung, floor anchored/overhead braced, and floor to ceiling anchored mounting options, but they also come in a wide variety of 100 percent recyclable color options. There are 18 different colors to choose from, as well as three different finishes. You will be able to match just about any color scheme there is, so that your business bathroom can feel like a part of your business. Our solid plastic toilet partitions are just one of the six quality partition materials that we carry. The others partition options include, put are not limited to, Phenolic Color Thru, Phenolic Black Core, Plastic Laminate, and Powder Coated Steel. We encourage our customers to look through each option’s benefits and drawbacks before making a final decision. If you are having trouble making a decision, you can always speak with one of our representatives. They will be happy to walk you through the advantages and disadvantages of each material. If you are looking to set up and stock up your company’s bathroom, we are the people to call. For more information about our products or shipping, please do not hesitate to reach out to us at your earliest convenience. Our plastic laminate toilet partitions are made from high-quality, durable materials. If you would like to order one for yourself, they are available online at your convenience. Every partition material has its benefits and drawbacks. It is important to understand your different options before you make a decision in investing in a new bathroom. At Restroom Stalls and All, we would be happy to walk you through your choices until you feel confident in your decision. We have listed some of the advantages to choosing plastic laminate for your convenience. Because this material is bonded under extreme pressure to a solid, impact resistant particleboard core, it can stand up well to most kinds of stresses, including damage from vandalism. Its one drawback is that it shouldn’t be used in high moisture areas, as the water affects the particle board. That means that this material type is not ideal if you plan to install a shower in your company bathroom. Our plastic laminate partitions can be mounted floor to ceiling or floor anchored. Call our licensed and insured installation team for more information. The mounting options you choose will affect both the style and functionality of your company bathroom. We’ll be happy to discuss each option with you. Our plastic laminate partitions can match a wide range of styles with their impressive color selection. There are over 21 different color options to choose from. These options are Mission White, Almond, Sand, Khaki Brown, Taupe, Pale Gold, Crisp Linen, Neutral Glace, Western Suede, Dali, Natural Canvas, Desert Zephyr, Casual Linen, Satin Stainless, Natural Tigres, Tungsten EV, Western Storm, Burnt Strand, Windswept Bronze, Brazilian Topaz, and Seed. 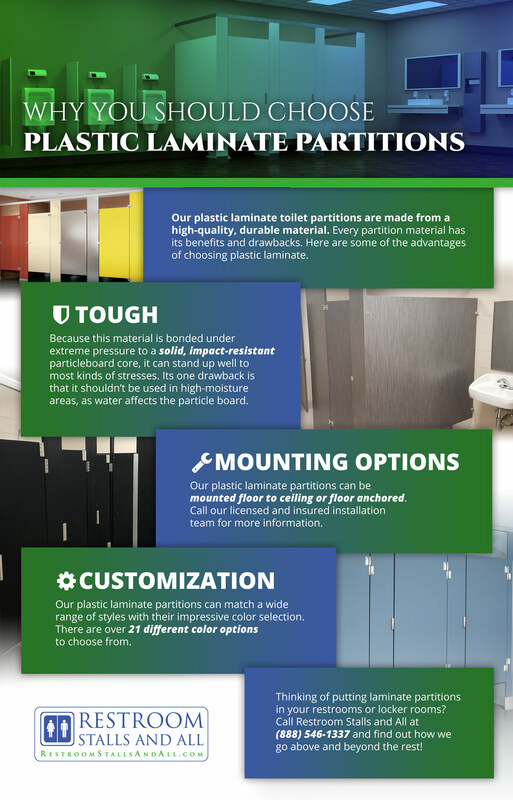 Our plastic laminate partitions are just one of our six toilet partition options. On top of selling high-quality commercial restroom stalls and bathroom accessories online, we also can perform installation of our restroom stalls at our client’s request. We are dedicated to providing only the highest quality bathroom products and services available. When you buy from us, you know you are getting what you pay for. Our work and products speak for themselves, just ask one of our previous happy customers. Contact Restroom Stalls and All today! Send Restroom Stalls and All your Restroom plans or measurements. Our experts are ready to answer all of your questions.